The Skerryvore Lighthouse Museum was the first of the Trust's projects and it remains an attraction at the centre of the Trust's continuing commitment to develop a modern self-sustaining Hebridean community at Hynish, on the Isle of Tiree. The Hebridean Trust was offered the Signal Tower at Hynish by The Northern Lighthouse Board in 1984. This was repaired and converted into the Skerryvore Lighthouse Museum. 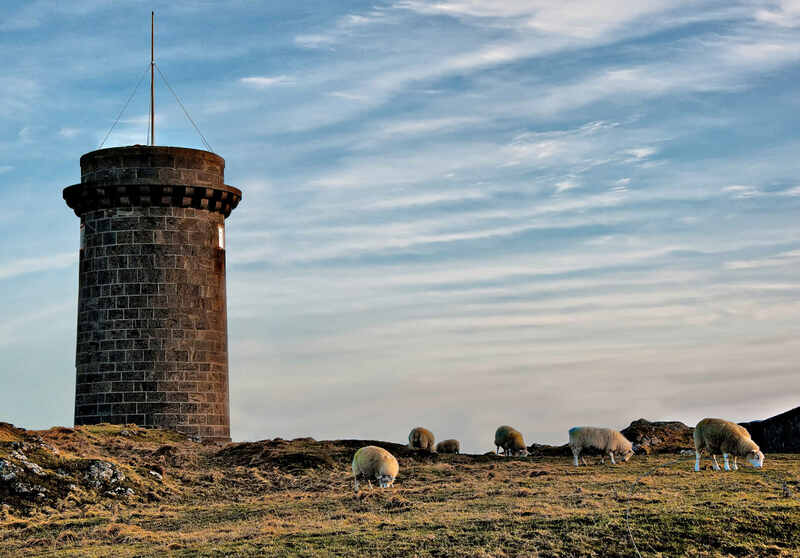 This small museum recorded the remarkable story of the design and construction of the Skerryvore Lighthouse by Alan Stevenson (uncle of Robert Louis Stevenson). The tower, which maintains a unique piece of industrial archaeology at the centre of a living community, was opened in 1987. In 2004 the museum relocated to the bigger space of Morton Boyd Hall. The old pierhead store was renovated to became Alan Stevenson House, providing activity holidays to young people facing physical, mental, emotional or social disadvantages. In 2010 the property was upgraded and made disabled-accessible with the aid of Charitable Trust grants and a timely and very generous donation from philanthropist Hamish Ogston. The Old Smithy was restored to provide additional accommodation with disabled access. It was named Morton Boyd House, after Morton Boyd the naturalist. The adjoining workshop was converted into Morton Boyd Hall, a large studio exhibition space, which houses the relocated Skerryvore Lighthouse exhibition. Restoration of a derelict cottage created further accommodation for the Warden and also the Tiree Information Office. In 2008 The Cottage was incorporated into the "Hynish Centre" (Alan Stevenson House, Morton Boyd House and The Cottage) which provides accommodation for up to 34 guests. In the late 1980s the Trust was offered the remainder of the Lower Square complex by Argyll Estates for a relatively nominal price. Various buildings, including the Old Barracks, were converted into social housing for local residents. In 2011 The old cowsheds were converted to the Treshnish Isle exhibition. The reconstruction and conversion of the four Lighthouse Keepers' Cottages at Upper Square, purchased in 1997 provides homes for island families at affordable rents. These wonderful and unique buildings (listed category A) were restored to the highest standard and can be enjoyed by all who visit Hynish as well as those who live there. The renovation project began in summer 2001 with funding from Argyll and Bute Council, Historic Scotland, The National Heritage Memorial Fund and grant-making trusts. The harbour, originally built to service the Skerryvore Lighthouse, has also been restored and is now used by both local and visiting fishing and pleasure boats. The harbour is complete with a freshwater flushing system, including a reservoir and aqueduct, to keep the harbour clear of sand. Other buildings have also been converted into general storage facilities for the Hynish Centre and for the local residents.